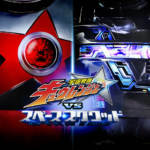 KyuRanger VS Space Squad Officially Announced! After months of speculation and rumor, a brand-new Super Sentai VS Project has been officially announced! This new direct-to-video adventure will be the first in a new sub-series known as V-CINEXT. The movie pits the 41st Super Sentai Uchu Sentai KyuRanger against the lengendary Metal Heroes of the Space Squad! Actor Yuma Ishigaki returns once again as Geki, the Space Sheriff Gavan and Hiroaki Iwanaga will reprise the role of Space Sheriff Shaider. Writer Nobuhiro Mouri (head writer for KyuRanger) returns once again for this story, and toku mainstay Koichi Sakamoto will direct. KyuRanger VS Space Squad will be released on August 8 2018! Stay tuned to TokuNation as we keep you up to date on this exciting project!